Getting good adhesion to painted wall surfaces has been a problem for sign makers and the manufacturers of vinyl films. Flat finish paints are especially a problem. To help your customer avoid the pitfalls that result in vinyl graphics falling off the wall, here are some guidelines to follow before beginning a wall graphics installation. New drywall must be primed and painted properly to ensure good adhesion of pressure sensitive vinyl wall graphics. Before priming, wipe off all of the drywall dust, sawdust and other contaminants that have accumulated on the walls during construction. Failure to clean the walls properly often prevents the primer from properly adhering to and sealing the drywall. Debris trapped in the paint will prevent you from achieving a good smooth surface, which is essential for good vinyl adhesion. If you will be decorating an interior wall surface, which is relatively clean, prep the surface by wiping the walls down with a damp rag. If there are rough spots caused by debris in the paint, you may need to lightly sand these areas before applying the vinyl wall graphics. Light colored flat finish paint is commonly used to decorate drywall surfaces, because it helps hide any imperfections in the drywall job. Flat finish paints, however, utilize additives that give the paint its matte or satin finishes. These additives prevent good vinyl adhesion. Here’s the remedy for these vinyl maladies. (1) For best painting results, you should paint new drywall with one coat of primer and two coats of either a gloss or semi-gloss paint. (2) Properly prep the wall surface prior to application. (3) Apply the graphics using accepted industry graphics installation techniques. Regardless of what brand and type of paint you are using, make sure the paint it thoroughly cured before applying the vinyl graphics. As a rule of thumb, allow the paint to cure for a week before applying any pressure sensitive films. To ensure that the paint is cured and that the adhesive system will stick to the wall surface, it’s best to “TEST, DON’T GUESS.” Apply a piece of the vinyl to be used to an inconspicuous place on the wall and see whether or not the graphics stay stuck. If the walls are newly painted or relatively clean, nothing more than wiping the surface with a clean, damp lint-free rag should be required. If an older wall surface is contaminated with years of grease, dirt and smoke film, the wall must be cleaned before either painting or application of pressure-sensitive materials. To ensure that the paint bites into an older painted wall surface, old time painters would wash the wall with trisodium phosphate or TSP. This heavy-duty cleaner will cut through the years of grease and scum that accumulate on a wall and etch the surface. Using a sponge, apply the cleaner to the wall surface. Drench the sponge in clean water, wringing it out until it is just damp. Wipe the dirt and grime from the wall surface. With a wet sponge wipe the surface immediately after cleaning. Failure to properly rinse the residue from the wall will contaminate the surface, which will likely cause problems when repainting the wall or applying pressure-sensitive wall graphics. 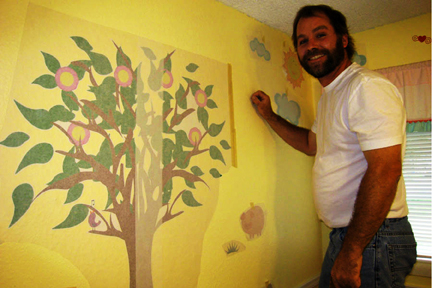 When applying vinyl graphics to painted drywall, always install the graphics dry. Do not perform a wet application to a drywall surface. When applying a wall mural, many professional installers will first string a taut level line marking where the top of the graphic will begin. Do not snap a chalk line (which may not wipe off cleanly from the wall surface) or install vinyl graphics over a chalk line (which can contaminate the adhesive of the vinyl graphics). Begin your application by peeling back the top few inches of the release liner. Position the vinyl graphic, tacking the material in place when you have the proper alignment. Starting at the top, squeegee the marking. Remove the liner as needed. Avoid repositioning the graphic as you work, because this can pull off any unsecure paint. In applying wall graphics, start your stroke in the center of the marking and squeegee horizontally from side to side. Always use overlapping strokes. After removing the application paper, resqueegee the entire marking, especially the edges, to ensure good adhesion.